Photos by Mike Szilagyi. Click on thumbnails to view higher-res images. Buckingham Valley Trolley Association chartered its 1926 Brill 8534, and 1948 PCC 2168, for a tour over Southwest Philadelphia's surface lines and the trolley subway under Center City. Over one hundred tickets were sold for this trip, which included the first trip through the subway for the 8534. Except for a few months during the summer of 1996, these rails on Route 15 have not seen streetcar service since the PCC cars were retired by the SEPTA board, in September 1992. Running over the former Route 62, PCC 2168 leads the 8534 over new rails and pavement in Darby Borough outside Philadelphia. This route is now a rush hour extension of Chester Avenue's Route 13. These tracks have been rebuilt in a concrete roadbed, unlike more recent "economy jobs" that feature blacktop and recycled rail. 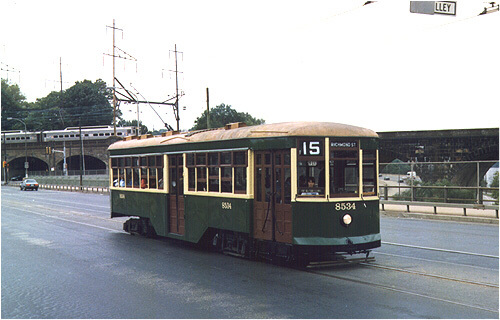 Philadelphia Rapid Transit Company ordered fifty trolleys, including the 8534, in 1926, expecting crush loads to the sesquicentennial site (near today's stadium area). The sesqui crowds never materialized, but the trolleys were put to good use over the next three decades. This, PTC's last batch of conventional (pre-PCC) trolleys were built to the same blueprints as the 485 cars purchased in 1923-24. The last of the 8000s lasted until 1958. Until the 1981 arrival of the Kawasaki trolleys, all service in the Subway Surface was provided by both pre-war and post-war PCC cars, including the 2168. By then the PCCs were showing their age, and breakdowns in the tunnel would often snarl the Routes 10, 11, 13, 34 and 36 for hours. With only a handful of lightly-used PCCs left to maintain, 2168 looks better than it has in years. The PCC led the Brill car through the tunnel with the idea that should the 8534 break down, the PCC could pull it out. Both the 8534 and PCC 2168 became stranded on the Girard Avenue Bridge for over an hour when the lead car ran under a section of de-energized wire. Because SEPTA has not formally converted the 15, 23, and 56 to bus (yet), the wire is to be energized at all times. In this case, a maintenance crew simply connected the insulator (visible top right in the photo) with a jumper, and the trolleys were able to continue. SEPTA employee Bob Hughes escorted the charter through West, Southwest, and part of North Philadelphia. Here he carefully guides PCC 2186 back at the 40th Street subway portal, watching that the pole doesn't snag the overhead. Bob Hughes managed the General OverHaul project that extended the life of these cars, and was featured in the PBS documentary "Taken for a Ride". The film re-stated the now-familiar story about General Motors' National City Lines, which purchased many transit companies in the 1940's and 50's and substituted its own diesel buses for thousands of trolleys. The fact is, GM/NCL's 1954 takeover of the PTC seems only to have hastened the inevitable in Philadelphia.